Midlands Fly Fishers is a private club of sixty anglers, who for the reasonable sum of £400 every year have some 12 miles of beats on rivers in the Severn and Wye catchment areas, including the smaller, more intimate Lugg and Onny, and also on the Welsh Dee, and so a plethora of opportunities to target our four major salmonids. Only the Onny beat is stocked so it is wild brown heaven ! 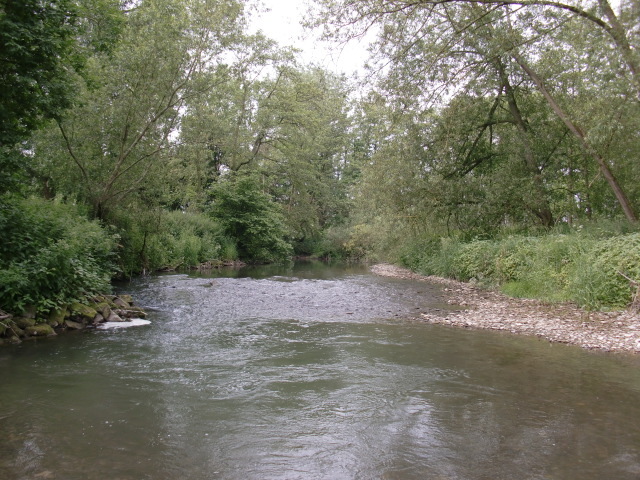 In addition, this area between the West Midlands and the Welsh Marches is teeming with small brooks and larger streams, such as the Teme the Arrow. By reputation the Lugg is difficult to get onto because its waters are protected for club and syndicate. But David invited me stay, and after an evening on the Worfe which runs through one of his farms it was partridge for dinner cooked by Marika, and washed down with Palmer 81…’great life, init?’ Then off under grey skys and through Ludlow and into Herefordshire, chatting easily and unbroken for an hour until we reached Mortimer Cross. We split up, and David’s advice was to work upstream crisscrossing…he spotted midges and recommended black gnat as a starter fly. I saw a rise…and crisscrossed…battling through wet bankside mud, and Himalayan Balsam, to a bend in the river. I, lazily, still had tied on the Tups from the previous evening, and two casts later I had my Herefordshire brown. Now…why did he take it? I read an article recently that such is the decline in fly life that trout are becoming less fussy…this may be true. Moving on upstream, I encountered runs and riffles and bends below which were many and seemingly deep pools. There were few fish moving and clearly they were lurking in the deeps, but true to my Halfordian principles and practices, and in spite of the obvious temptations, not a nymph was tied even though I knew they were there, and for the taking. The river here was wooded and was accessed by treading carefully, hands and rod upstretched through fields of nettles as high as a man. It took too long to realise that the occasional white posts were there for a reason ! This lovely stretch opens up some one mile upstream. Here the river meanders gently through open meadows, and with a cloudy sky, the fish were feeding, although rises were infrequent. Here, David and I caught up, and both took a brace. Thank you, Hereford….thank you, the Lugg….thank you, David. We ventured to the Onny, to try to capture the second county of the day, but were thwarted by the colouration of heavy overnight rains coming off the Cambrian mountains. So I must wait to add Shropshire until next season!